The eastern slopes of Table Mountain provide the magnificent backdrop to Kirstenbosch National Botanical Garden and a nature-lover’s paradise of pristine fynbos and forest, in a stunning landscape. The Kirstenbosch estate covers 528 hectares, of which 36 ha is cultivated and the rest is a protected area supporting natural forest and fynbos, and indigenous wildlife, including birds, mammals, reptiles, frogs and insects. Kirstenbosch is adjacent to the Table Mountain National Park, and both form part of the Cape Floristic Region Protected Area, which was proclaimed a UNESCO World Heritage Site in 2004. 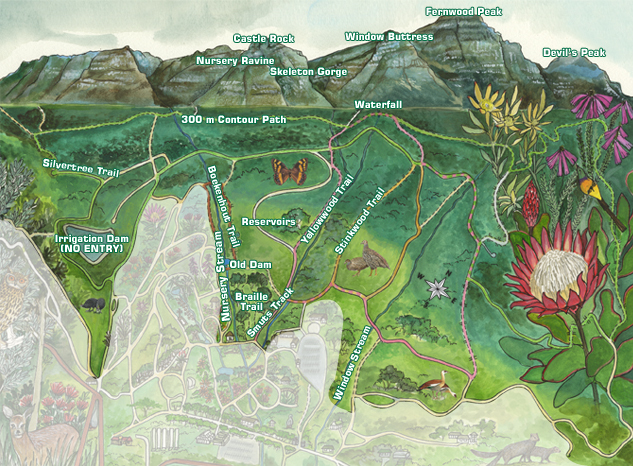 The Kirstenbosch estate can be explored via five trails, of differing levels of difficulty. All are well-maintained, logged footpaths or gravel roads and are sign-posted. The Braille Trail and Boekenhout Trail are ideal forest walks for those pressed for time and the not so fit. The Stinkwood Trail is a relatively short exploration of the oldest part of the forest with some of the largest trees. The Yellowwood Trail and Silvertree Trail are long hikes that take you up to the waterfall and around the estate, through both forest and fynbos. It is possible to climb Table Mountain from Kirstenbosch, up Nursery Ravine or Skeleton Gorge. Find out more about the geology of Kirstenbosch and learn to identify the different rock types that can be seen on the trails. Please take care when hiking on Table Mountain – it has many sheer cliffs and steep gorges and unpredictable weather. Also, people have been mugged on the mountain. Please follow these safety guidelines when walking or hiking on the mountain. Dogs are not allowed in the cultivated Garden or in the natural area immediately surrounding the Garden as far as the upper contour path. Dogs may be brought in via Rycroft Gate (Gate 3), and walked up to the 300 m contour path via the Seed Orchard/Stock Beds. See the Dogs Map for the dog-walking paths and dog exclusion zone. Dogs may also be brought in from Cecelia Plantation or Newlands Forest and walked along the 300 m contour path. Dogs must be kept on a leash at all times, and dog walkers must pick up and dispose of their dog’s litter. Visitors caught breaking these rules may be fined. When visiting Kirstenbosch, enjoy this beautiful place, protect our natural heritage and please abide by the rules.